Most women’s fiction novels center around a protagonist who puts relationships at the center of her life. Children, especially, are most important—even if those children aren’t her own, or are practically strangers. 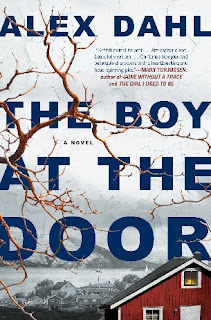 But in Alex Dahl’s debut, The Boy at the Door, her protagonist, Norwegian wife and mother Cecilia Wilborg, seems to care more about her social standing and her tennis dates than her children. And when she’s asked to help the mysterious Tobias, a grade-school aged boy who appears to have been abandoned at the local swimming pool, she’s more concerned about what the neighbors may think than about the child’s welfare. But Cecilia is much more complex than she seems, and the mystery of Tobias’s origins is only one of several in the novel. The story is told from three points of view: Cecilia and Tobias’s first-person points of view (one of the issues I had with the novel is that Tobias’s voice is much too sophisticated for a boy his age, especially one who has never been to school), and through the diary of Annika, the drug addict who abandoned Tobias. After her dead body is discovered, DNA testing reveals that she was not Tobias’s mother. So who was? How did Tobias end up with Annika and her abusive boyfriend, who has also disappeared? And who killed her? The Boy at the Door was not the story I thought it would be when I picked up the novel. I was not expecting such an in-depth look at the causes and consequences of long-term drug addiction as depicted by Annika, and her story broke my heart in a way that doesn’t often happen while reading a thriller. However, the long sections of her diary did slow down the pacing of the book somewhat. While I was moved by Annika’s tragic life story, my real interest was how she ended up with Tobias. Cecilia is the more problematic character—while it turns out she is also hiding secrets, hers are of her own doing, and she never becomes truly sympathetic, even when she has a breakdown. While the mystery was twisty enough to keep me reading, others may find Cecilia so abhorrent that they don’t stick around for its resolution. That would be a shame. Although this is her debut novel, Dahl is a confident writer who doesn’t leave a single thread untied by the book’s conclusion—every set up is paid off. Readers who are tempted to give up on the book due to Cecilia’s duplicity are highly advised to stick it out to the end.